Walter White (Bryan Cranston) and Jesse (Aaron Paul) in "Breaking Bad"
During the AMC panel at the Television Critics Association press tour, currently taking place in Los Angeles, executives at the cable network announced that Breaking Bad is going back into production next week to start work on its fourth season. The season won’t air until summer, but any news is good news for my favorite series. 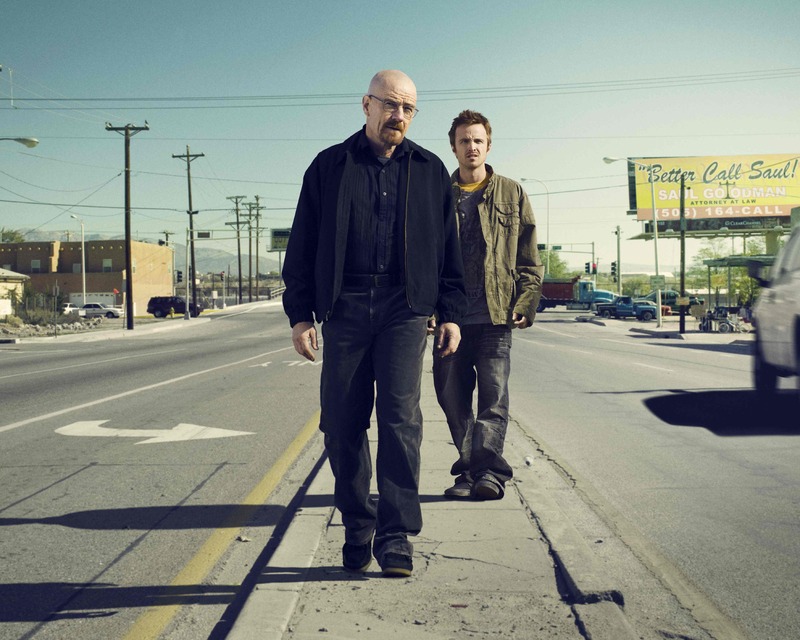 With everything that happened during the third season finale, I can’t wait to see what Vince Gilligan and company have in store next for Walt, Jesse, Skylar, Hank, Gus, and everyone else in the outstanding cast. Pasadena, CA – January 7, 2010 – AMC announced today, from the Television Critics Association press tour in Pasadena, CA, that the cast and crew of AMC’s Emmy® Award-winning and highly acclaimed original drama series “Breaking Bad” returns to Albuquerque, NM on Thursday, January 13 to begin production on season four. From acclaimed writer/producer/director Vince Gilligan, the series follows the story of a desperate man who turns to a life of crime to secure his family’s financial security. Season four consists of 13, one-hour episodes and is set to debut on AMC in summer 2011. “Breaking Bad” stars 2008, 2009 and 2010’s Emmy® Award winner for Outstanding Lead Actor Bryan Cranston as Walter White; 2010 Emmy® winner for Outstanding Supporting Actor in a Drama Series Aaron Paul as Jesse Pinkman; Anna Gunn as Skyler White; Dean Norris as Hank Schrader; Betsy Brandt as Marie Schrader; RJ Mitte as Walter, Jr; Bob Odenkirk as Saul Goodman; Giancarlo Esposito as Gus Fring; and Jonathan Banks as Mike. “Breaking Bad” follows protagonist White, a milquetoast high school chemistry teacher who lives in New Mexico with his wife and teenage son who has cerebral palsy. White is diagnosed with Stage III cancer and given a prognosis of two years left to live. With a new sense of fearlessness based on his medical prognosis, and a desire to gain financial security for his family, White chooses to enter a dangerous world of drugs and crime and ascends to power in this world. The series explores how a fatal diagnosis such as White’s releases a typical man from the daily concerns and constraints of normal society and follows his transformation from mild-mannered family man to a kingpin of the drug trade. “Breaking Bad” is produced by High Bridge Productions, Inc. and Gran Via Productions in association with Sony Pictures Television for AMC. AMC’s Joel Stillerman, senior vice president of original programming, production and digital content, Susie Fitzgerald, senior vice president of scripted development and current programming and Jason Fisher, senior vice president of production oversee production of the series for the network.